The more followers an influencer has, the more interesting he or she becomes in terms of marketing. However, it is not enough for a brand to find an influencer with many followers. In this marketing strategy, it is crucial that the companies fit the influencer and the other way around. Most of the time, the influencer has a certain set of skills and knowledge about a specific field like make-up, traveling, sports, or wellness. Recommending useful products is naturally part of the content. Here the companies step in. Depending on the number of followers, brands are willing to pay high amounts of money, in order for influencers to promote their products. If an influencer wants to earn money this way, he or she needs to keep the balance between advertising and still appearing credible and trustworthy to their followers. Although the word influencer in mentioned meaning is new, the word itself is in use for a while now. The usage of the word in the sense ‘a person or thing that influences another’ can be traced back as early as the 1660s, referring to state and church leaders. The newer meaning of the term, however, has found its way in our everyday language. There are many compounds with the word influencer like social-media influencer, indicating the platform or mega-influencer indicating scale. People become even more inventive. They start using ‘-fluencer’ as a suffix, making up blended words like thinkfluencer. The English word influencer also has an impact on other languages. In Germany, for example, Influencer was voted the Anglicism of the year 2017. 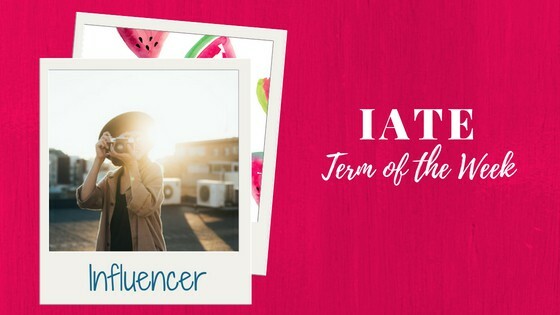 The jury argued that the new phenomenon needed a name and the word influencer added supplementary meaning to alternative German words. Pretty influencing this influencer.